It's my personal favorite time of the year--October! Which means Halloween! Which means everyone else starts reading and watching all the stuff I do 365 days of the year! As has become an annual tradition at Panel Patter, we'll be hitting horror comics especially hard this month, though it's always one of our focuses, as you can see at this horror comics tag. Halloween brings out the best in creators, I think, and it's an especially good time to follow your favorite artists as they draw some of their favorite creepy creations, whether it's a classic monster or something new. Comics historians know that horror and comics have been great pals for decades, even if there was a forced separation in the US. Japan had no such issues, so horror manga is some of the weirdest, creepiest, and scariest stuff you'll find on a printed page with pictures. First up will be a non-fiction comic, but those who prefer things that aren't real (or ARE they? ), we'll do plenty of coverage of horror, new and old, across the rest of the month. 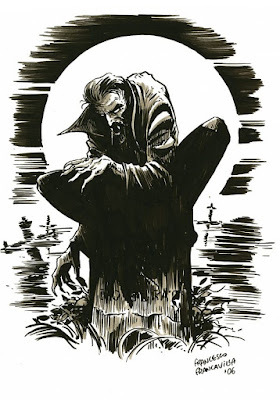 I'll leave you with a great image from one of the best at doing horror images today, Francesco Francavella. This was a commission he did in 2006, and you can see it--and many many other great pictures at his website, which I encourage you to do. He also is VERY active on Tumblr and Twitter, sharing his work. Go check it out! Drawing by the great Francesco Francavilla! Happy Halloween, everyone! Let's get scared together!